Snap Frames: A New Framing Solution for Artwork, Posters and Other Graphics! We are pleased to introduce ‘Snap Frames’, an innovative new way to easily frame and change out your posters, artwork, signs and other graphics as often as you’d like! Now you can change your graphics and printed posters EVERY DAY! No more permanent glass and matte board, just switch out graphics easily…it’s a SNAP! The ‘snap effect’ comes from spring loaded sides. You simply place your artwork within the aluminum frame and snap it in place. There is a rigid styrene backing to keep the image flat and in the right position at all times. Snap Frames have hundreds of uses: from advertising plays, bands and other special events to displaying information at conventions and tradeshows; from advertising sales and grand openings to directing guests at weddings, reunions and other public events. Just use your imagination! There’s no better way to display posters for events that change daily! You don’t even have to take your frame down off the wall when you want to change the sign, image or poster; just snap the front open and and pop a new poster in! 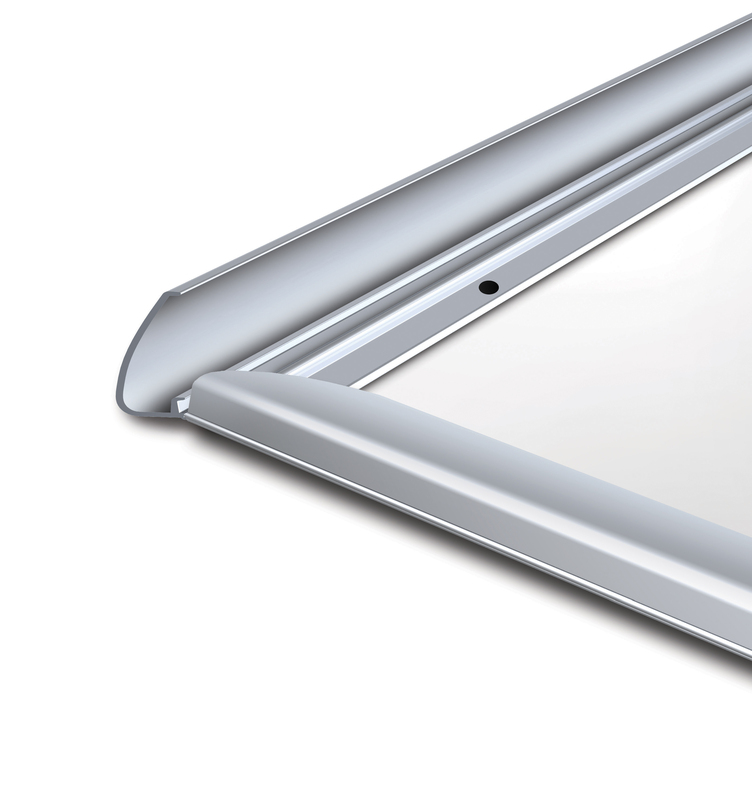 The aluminum frame is available in two colors: satin silver or matte black. 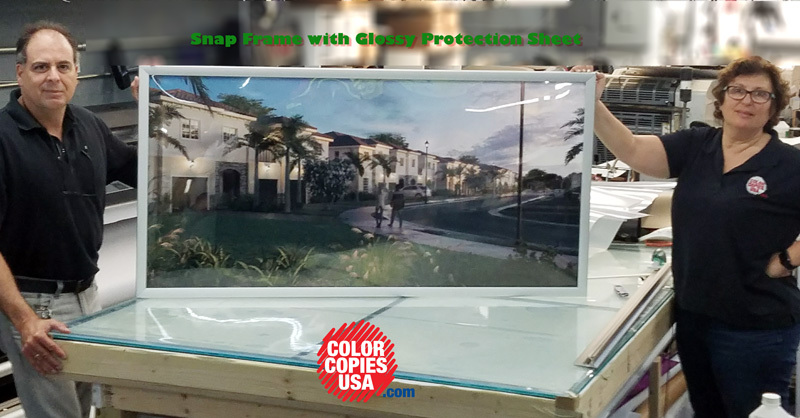 Snap Frames are easy snap aluminum frames that are proudly made in the USA. We can even imprint your company logo on the aluminum profiles! ● Recommended for indoors, with no direct sunlight. ● Standard Sizes available from 8”x10” up to 36”x48” with a total of 24 different sizes. ● Front loading frame with strong PVC frame that accepts posters up to 1/32” thick. ● There are vertical and horizontal mounting holes. ● Wall screws and anchors are included. ● A plastic corrugated backer is provided. ● There are no springs in this model and it ships pre-assembled. With over 45 standard combinations of size, aluminum color and clear or matte lenses, you can easily customize your framed artwork, posters, graphics to your liking. Call (877) 421-0668 to learn more about snap frames, posters, signs, color copies and printing of all types. We’re ColorCopiesUSA and we help people around the USA with their discount digital printing needs! Author Rick WatersPosted on September 25, 2017 September 25, 2017 Categories PrintingTags aluminum poster frames, Aluminum Snap Frames, snap frame, snap frames, snap poster frameLeave a comment on Snap Frames: A New Framing Solution for Artwork, Posters and Other Graphics! Lucky Ideas for Making St. Patty’s Day Event a Rousing Success!